Accommodation, breakfast, dinner, wine, pocket Wi-Fi. Reservations canceled within 2 days of the scheduled arrival date are subject to a 100% cancellation penalty. Pets are not allowed at this property. There are pets that live on this property, although not in the treehouses. Kotsifas estate is 5 km from the town of Amaliada. There is a morning bus to town and one in the afternoon. Buses to Ancient Olympia and surroundings beaches are available also. There is a bus station in Amaliada, and the port of Patras is only a one-hour drive away. If you are looking for an exclusive piece of nature, all organic lifestyle, friendly host family and beautiful beaches and surroundings, then visit Treehouse Greece some day. And remember, life is an adventure. 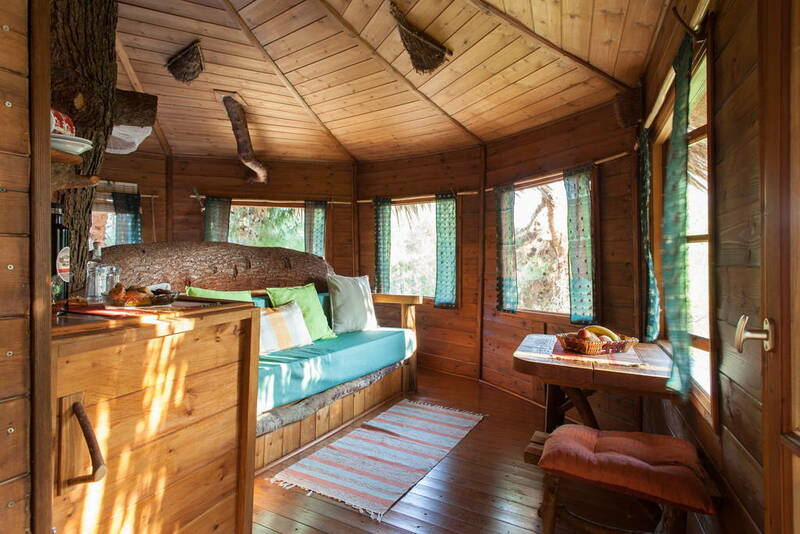 The first treehouse is cozy and perched high in a pine tree; it includes double bed, couch, table, bathroom and balcony—plus a downstairs, outside setting, with table and chairs and sun lounges. This treehouse accommodates two to three people. The second is a family treehouse that accommodates up to eight people and has a full kitchen, lounge and wrap-around balcony. It is set right in the forest, overlooking the valley to the sea. Guests have access to the property, olive orchards, nature walks, wild food collection and seasonal activities. Other attractions include local arts and crafts, wine tasting, natural therapies, and nearby beautiful, sandy beaches and ancient ruins.